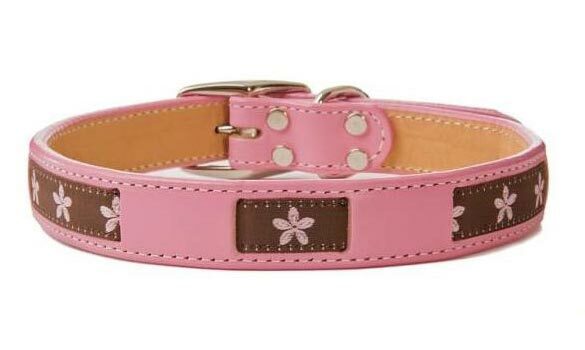 The "Pink Flower" Leather Dog Collar, a unique high quality full grain leather collars with fashion & flair! Add a flower accessory to give your pup a sophisticated, fashionable look. Made in the USA! The Pretty in Pink Leather Dog Collar, a unique high quality full grain leather collars with fashion & flair! Add a flower accessory to give your pup a sophisticated, fashionable look. Brown ribbon with pink flowers. Designer collar by Bookie and Belle.